Brian is an entrepreneur and former class action lawyer who has recovered over a half a billion frequent flyer miles wrongly taken from his clients. Obsessed with the accumulation and use of miles for free upper class airline travel, Brian saw the need for a service that could help others make this magnificent experience a reality. Brian has traveled the world with his wife and children almost exclusively through the use of frequent flyer miles – which has given him extensive insight into how to most effectively accumulate and use them – and how to help others do the same. Theo is medical doctor with an MBA from the Wharton School. He is a self-admitted “travel-aholic”…. Along with his wife and children, Theo travels the world, in search of new lands, breathtaking scenery, and fascinating people. His global travel as a medical researcher ignited a lifelong passion for the road, runway, and waterway less traveled. While traveling on research assignments in the quest for innovative new drugs, he developed his second infatuation – how you travel in luxury for much, much less! He has become one of the world’s preeminent experts on strategies of how to best use frequent flier miles, upgrades and hotel points. From the Holiday Inn to the Hyatt, from the QEII to the Concorde, from Bali to Brussels, Theo has learned the secrets of traveling in luxury for less. He has over 10 million frequent flyer miles under his belt, having visited more than 39 states and 30 countries on six continents. 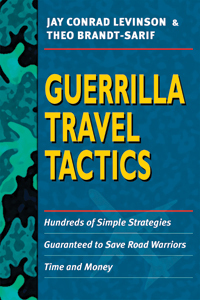 Theo is the co-author of Guerrilla Travel Tactics: Hundreds of Simple Strategies Guaranteed to Save Road Warriors Time and Money. He lives in Los Angeles with his wife Deborah and their three children. But don’t look for them there, as they’re likely someplace else!